More than eighty milestone donors have been celebrated over the last few weeks for their commitment to the Welsh Blood Service, with a selection of guests reaching their 100th donation milestone after decades of giving blood. Two awards ceremonies have recently been held at the Metropole Hotel, Llandrindod Wells, with local blood donors celebrated for their 50th, 75th and 100th donations alongside bone marrow donors, who were potentially one of the only matches in the world capable of saving their recipients. An incredible 13,200 lives have potentially been saved between the donors, as each blood donation received can save as many as three lives. To reach the award ceremony, blood donors would have needed to donate whole blood for over ten years. Brothers Phillip Owen and Stephen Owen from Builth Wells have given over 100 donations between them and are now encouraging others to start giving blood. Stephen, 49 from Cae Castell, said: “Our father and our uncle were dedicated blood donors, they both encouraged us to start giving blood from a young age. We’ve been donating since we turned 17. The Welsh Blood Service need to collect over 100,000 units of blood every year to supply hospitals in Wales with blood for patients in need. 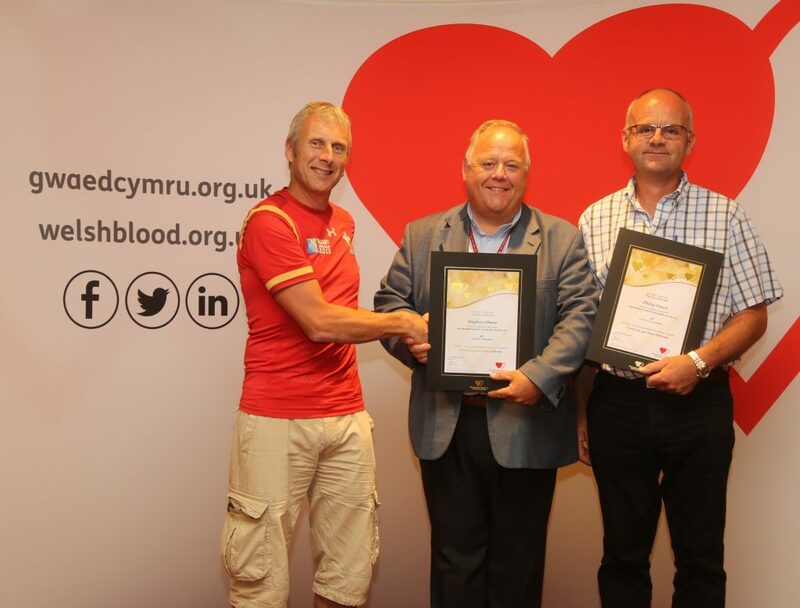 Jonathan Ellis, Head of Donor Engagement at the Welsh Blood Service, said: “We’re thrilled to host the donor awards to celebrate the achievements of all our milestone donors in Llandrindod Wells to thank them for their generosity over the years. “The unwavering commitment of our donors has helped thousands of patients in need across Wales receive potentially lifesaving donations. The Welsh Blood Service will be holding a donation session in the Metropole Hotel on Thursday 4th October and Friday 5th October 2018. To book an appointment or to view the full list of clinics, visit welsh-blood.org.uk or call 0800 252 266.